Air Force Gen. John Hyten, head of the U.S. Strategic Command, has said the U.S. Navy could work with the U.S. Air Force to develop an airborne command-and-control aircraft that will replace the Navy’s E-6B fleet, Defense News reported Wednesday. Aaron Mehta writes Hyten told Congress members the Navy has started planning for the development of an E-6B replacement aircraft and that the service branch aims to deploy the platform by 2038. 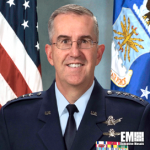 “We’re only 20 years from 2038, so if you’re going to build large aircraft with huge command and control [requirements], you have to start thinking about those things right now,” said Hyten, an inductee into Executive Mosaic‘s Wash100 for 2017. E-6B is based on Boeing‘s 707 commercial aircraft and designed to provide airborne command, control and communications support. Adm. Bill Moran, vice chief of naval operations, said the E-6B replacement program could align the Air Force’s efforts to replace other 707-based command and control platforms such as the E-8C joint surveillance target attack radar system, E-3 airborne warning and control system and OC-135B Open Skies aircraft, FlightGlobal reported Wednesday. 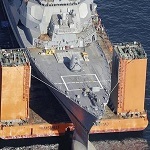 Moran added that the Navy and Air Force should consider a joint program since the two military branches have similar requirements for aircraft size and shape, capacity and endurance.